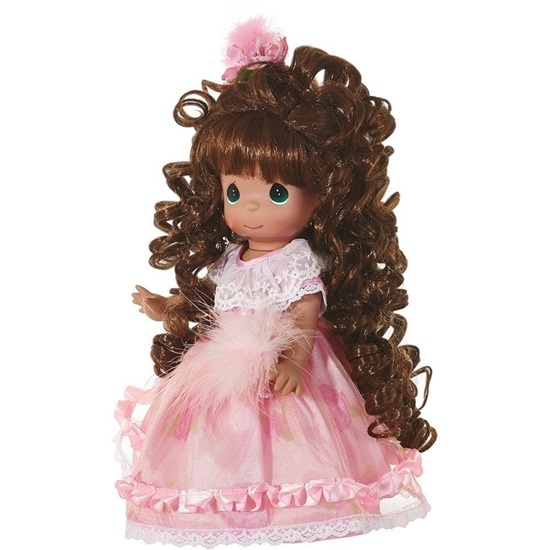 This adorable beauty from Precious Moments will charm her way into your heart. She is dressed in a sheer pink dress with a floral mesh overlay edged with pink satin and lace. The bodice is also sheer pink with a white mesh overlay edged in lace. She is 12 inches tall and her head, arms, and legs are jointed. She has green tear drop shaped painted eyes. Her long curly brown hair tumles down her back and is clipped up on top of her head with a pink flower and feather clip. White mary janes complete her springtime ensemble She is perfect for ages 14 and up.